Throughout the month, there are many cases or stories that break regarding forced labor. They are usually not on the front pages of our newspapers, rather they are buried deep and sometimes are only accessible through the internet. These are some of the stories, both headline articles and those that are not, from November. Markus Löning, Germany's Human Rights Commissioner, criticized Uzbekistan for its use of child labor in the yearly cotton harvest. He demanded that the country allow monitors to enter the country and that it stop using children during the harvest. Each year, in September, schools are closed and students as young as seven are forced to pick cotton in the fields. The country has signed two Conventions against child labor and Löning asked them to honor their commitments. At least 65 retailers including Gap and Wal-mart, boycott Uzbek cotton. Debates raged throughout November about whether or not carpets made in India would lose designation as being produced through child and or forced labor by the United States Government. The Deputy Undersecretary of Labor, Sandra Polaski, said that the US had not determined the status of the carpets, while India's Carpet Export Council claimed that the US would drop the designation. The Department of Labor clarified that it had not removed India's carpet industry from the list, but rather believed there was not enough suitable information to determine whether it should be kept on the list. 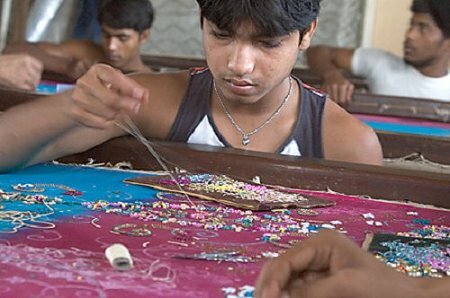 They are awaiting the results of a study on child and forced labor in Asia to determine if India should remain on the list. The Irish Human Rights Commission asked Ireland's Government to launch an investigation of the Magdalene laundries or asylums, where women of ill-repute were forced to undertake forms of hard labor including laundry work, even into the 20th century. The Commission said that appropriate redress should be provided to the survivors of the institutions. The findings included evidence that the State knew and was involved in the process of sending women and girls to the laundries. It is also possible that the Government violated obligations it undertook through the 1930 Forced Labor Convention by not outlawing or stopping the laundries and by trading with the convents that were running the laundries. The Government admitted as early as 2001 that the women were victims of abuse but no redress has been provided. No agreement was reached on the future of Zimbabwe diamonds after a four day meeting of the Kimberly Process. While the Chairman, Boaz Hirsch, said he was hopeful that an agreement could be reached within a few days after the meeting, as of the end of November there still was no deal. Obert Mpofu, Zimbabwe Mine's Minister, said that despite the lack of an agreement, diamonds would still be for sale with no conditions to those who wished to purchase them. Sales of Zimbabwe's diamonds were barred last year due to human rights abuses, including the use of forced labor, in the Chiadzwa fields. Three illegal immigrants were indicted by a federal grand jury in connection with a human trafficking scheme which forced its victims to sell CD's and DVD's. Charges included conspiracy to harbor illegal immigrants and conspiracy to force labor. Victims were recruited from Mexico and forced to sell the pirated wares. The accused are believed to have intimidated victims into working until they paid off their debts. After Cyclone Giri, which hit Myanmar at the end of October, the Government began forcing affected villagers to assist with renovations including helping rebuild military sites without pay. This was one of the hardest affected areas by the cyclone. The villagers are staying in makeshift huts, since many people have not been able at this point to rebuild their own homes and since they are forced to work from dawn to dusk on Government/Military projects. don't you think this is inhuman for the government to let villagers work almost the whole day! how about their own sake and the family as well, which the government should be the one taking care of. human trafficking is taking its toll to the peak and must be examined in the magnifier.